FRISCO — Most star athletes play on both sides of the ball in high school. It’s rare to specialize at the prep level because the truth is that the best athletes tend to make an impact whether it’s on offense or defense. Some dream of playing both ways in college, but that’s uncommon for it to materialize. The demands of one position are hard enough. Two seems impossible. Not to McCoy. The nation’s No. 2-ranked athlete is set on excelling at wide receiver while also contributing at linebacker on third downs. The 6-2, 205-pounder is from Mater Dei in California, a state in which Texas is building a consistent pipeline under Tom Herman. USC and Texas are the top two schools for McCoy. He grew up a USC fan. His friend, UT commit De’Gabriel Floyd, is pushing him toward Austin. 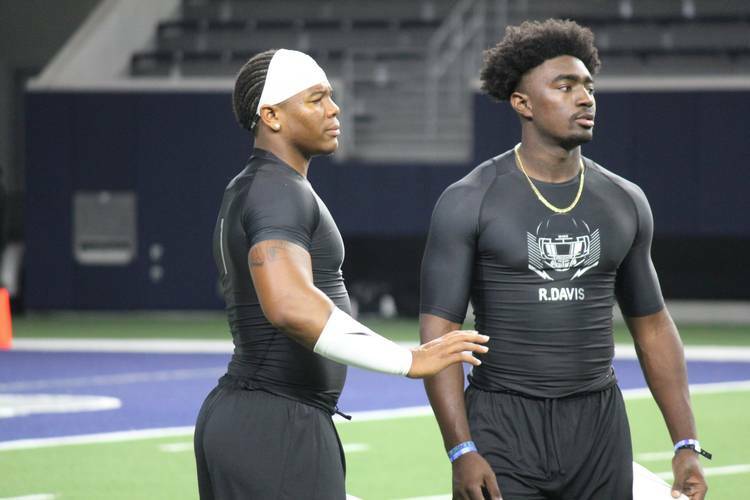 It forced the five-star athlete to take an unofficial visit to Texas recently. He’ll join Floyd back in Austin for the USC game when McCoy takes his official visit. Two of Texas’ 11 commitments are from California after four-star safety Chris Adimora (Mayfair) joined Floyd in the 2019 cycle. The Longhorns signed quarterback Cam Rising and JUCO offensive lineman Mikey Grandy out of California in 2018. McCoy isn’t the only player Floyd is recruiting during his time in Frisco for The Opening Final. The Texas commit clung to Davis, a four-star middle linebacker from Wekiva (Fla.). The four-star checked in at 6-2 and 233 pounds. He’s consistently been among the best linebackers at the event, which is built for offenses and defensive backs to shine. He was a two-time all-district selection at Houston Clear Lake before moving to Florida for his senior season. His uncle still lives in Texas and the Longhorns are clearly in the mix after a recent official visit. Davis said he talks to defensive coordinator and linebacker coach Todd Orlando nearly every day.